Last week, we told you how to get out to the US Open on a boat for just $1.00. 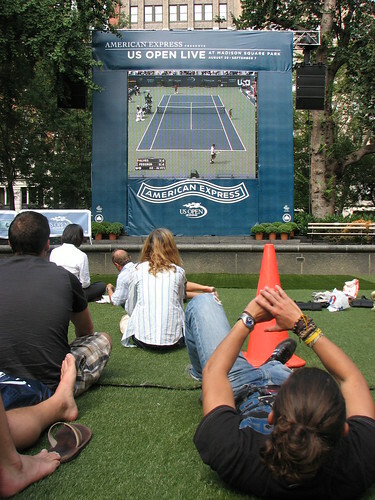 Well if you're not heading out to watch some tennis in person, you can enjoy festivities taking place through Sunday in Madison Square Park. There will be an LED jumbo screen set up with the matches and you can practice your forehand on ping pong tables in the ZYNC Zone (11AM - dark). Every afternoon, ZYNC will also be giving away three pairs of tickets to the following day’s US Open matches. Enjoy! does anyone know what time the free tickets will be given out?